It is true that Canada today is in need of high skilled and educated immigrants. Indeed they help in the growth of the local economy and also create additional jobs. 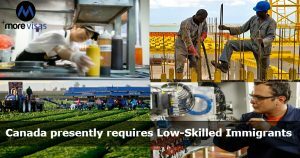 For now, Canadian employers are facing a great trouble to fill up positions which need low skills. There is a great need of truck drivers, farm workers, and food service staff. Some recent investigations say that presently the employers in Canada have the challenge of an aging workforce. Farm jobs as well as blue-collar labour jobs remain vacant. As a result, many employers cannot meet their product demand. Moreover, they cannot expand their business. This investigation also shows that there is a mismatch. There is a deficiency in the available jobs and in the arriving immigrants. Canada has the reputation of a safe, welcoming and friendly nation. It greatly appreciates the contributions which the immigrants make in their economy. Presently, Immigration law has become challenging and complex. Immigration applications are refused owing to oversights or omissions. This tendency causes a delay and has a negative impact on the business or other plans. The timely and strategic advice regarding changing laws and regulations is always necessary.